Inspired by Daniel James Brown’s critically acclaimed nonfiction book The Boys in the Boat: Nine Americans and Their Epic Quest for Gold at the 1936 Berlin Olympics, American Experience The Boys of ’36 is the thrilling story of the American Olympic rowing team that triumphed against all odds in Nazi Germany. Executive produced by Mark Samels and produced by Margaret Grossi and Mary Carillo, The Boys of ’36 premieres on Tuesday, August 2, 2016, 8 p.m. CT on OETA-HD. The Boys of ‘36 explores how nine working-class young men from the University of Washington took the rowing world and the nation by storm when they captured the gold medal at the 1936 Olympic Games in Berlin. These sons of loggers, shipyard workers and farmers overcame tremendous hardships — psychological, physical and economic — to beat not only the Ivy League teams of the East Coast but Adolf Hitler’s elite German rowers. Their unexpected victory, and the obstacles they overcame to achieve it, gave hope to a nation struggling to emerge from the depths of the Depression. Featuring interviews with author Daniel James Brown, historians and surviving children of the 1936 Washington team, The Boys of ’36 premieres on American Experience in August on PBS in conjunction with the Summer Olympic Games in Rio de Janeiro and the 80th anniversary of the miracle crew’s triumph. The broadcast of The Boys of ’36 will be accompanied by a series of screening events across the country, many in partnership with USRowing, a nonprofit membership organization recognized by the United States Olympic Committee as the national governing body for the sport of rowing in the United States. In 1936, the UW offered no scholarships for rowing, but did assist the athletes in finding part-time employment. Even with jobs, several found it hard to make ends meet; some even joined the team because they knew they knew they would be fed regular meals. 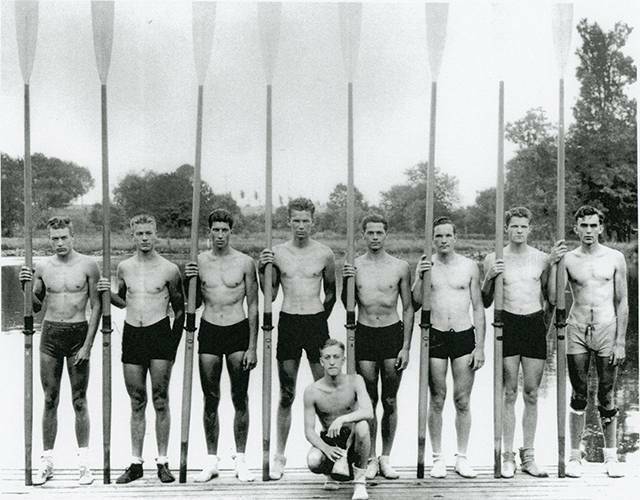 Bobby Moch (June 20, 1914 – January 18, 2005), just five-foot-seven and 119 pounds, was the team’s coxswain. Born and raised in Montesano, Washington, Moch graduated from the UW and signed on as an assistant crew coach for the 1936-37 season. He entered law school and was offered the head coaching position at MIT in 1940. Moch transferred to Harvard Law School and continued to coach. He would go on to a successful legal career, eventually arguing and winning a case before the U.S. Supreme Court. Don Hume (July 25, 1915 – September 16, 2001) set the pace as stroke oar for the team in the #8 seat. As a boy, Hume had worked in a pulp mill and fumes had damaged his lungs, making him susceptible to respiratory illnesses. He spent the war years serving in the merchant marines. Following the war, he built a career in oil and gas exploration and later became president of the West Coast Mining Association. Joe Rantz (March 31, 1914 – September 10, 2007), #7 seat. Born in Spokane, Joe was four when his mother died and he was sent east to live with an aunt. He eventually returned to his father and new stepmother but when troubles arose, the family moved away and left the teenager to fend for himself. He eventually moved to Seattle to live with his older brother, and in high school was recruited by coach Al Ulbrickson. Rantz graduated from the UW in 1939 with a degree in chemical engineering. He went to work for Boeing in 1941 and later retired from the company. George “Shorty” Hunt (August 1, 1916 – September 3, 1999), #6 seat and a standout high school athlete, became a Seabee in the South Pacific during World War II and cofounded a construction company following the war. Jim “Stub” McMillin (March 8, 1914 – August 22, 2005), #5 seat, worked nights as a janitor to make ends meet while at the UW. After college, he took over Bobby Moch’s job at MIT, where he both coached and worked on classified research as a lab engineer for 12 years. He later returned to Seattle and worked for Boeing. John White (May 16, 1916 – March 16, 1997), #4 seat, graduated from the UW in 1938 with a degree in metallurgical engineering. He followed his father into the steel business and worked for Bethlehem Steel. Gordon Adam (May 26, 1915 – March 27, 1992), #3 seat. Adam worked on a salmon boat while at the UW. He ran out of money before he could graduate and took a part-time night job with Boeing in his senior year. He remained there for the next 38 years. Charles “Chuck” Ward Day (October 19, 1914 – May 1962), #2 seat. Born in Colville, Washington, Day earned his medical degree and entered the Navy at the outbreak of the war. After serving as a naval doctor in the South Pacific, he returned to Seattle and established a successful practice. Roger Morris (July 16, 1915 – July 22, 2009) was the Bowman (#1 seat) on the team. While at the UW, Morris worked for his father on the weekends, moving families out of homes they had lost to the Depression. He graduated with a degree in mechanical engineering and spent the war doing military construction in the San Francisco Bay Area. He then returned to Seattle to work for the Manson Construction Company. Al (Alvin) Ulbrickson (1903 – 1980) became head coach of the UW’s crew team in 1927. Under his leadership, the Huskies went to the Olympics three times. His varsity crews won six IRA titles; his junior varsity won ten. He was inducted into the National Rowing Hall of Fame in 1956. George Yeoman Pocock (March 23, 1891 – March 19, 1976). A native of England, Pocock was a leading designer and builder of racing shells. Pocock-built shells began to win U.S. Intercollegiate Rowing Association championships in 1923, and he was appointed Boatman to U.S. Olympic Rowing Teams in 1936, 1948, 1952 and 1956. A mentor to many of the day’s rowing coaches, Pocock was named "Sports Star of the Year" for 1948 by the Seattle Post-Intelligencer and was inducted into the Helms Rowing Hall of Fame in 1969. Daniel James Brown is the author of the critically acclaimed nonfiction book The Boys in the Boat: Nine Americans and Their Epic Quest for Gold at the 1936 Berlin Olympics. The Boys in the Boat is published by Penguin Books, an imprint of Penguin Random House, and has been on The New York Times bestseller list for over 90 weeks. Eric Cohen, a former Husky coxswain (1979-82), is the rowing historian at the UW and the creator of a website devoted to its history. Timothy Egan is an author and New York Times columnist whose latest book is The Immortal Irishman. He is a graduate of the UW. Robert (Bob) G. Ernst became the UW varsity men’s crew coach in 1988. In 1997, he led the team to a sweep of the varsity, junior varsity and freshmen races to capture the IRA Championship in Camden, NJ. David Clay Large is the author of Nazi Games: The Olympics of 1936. Peter Mallory is the author of The Sport of Rowing: Two Centuries of Competition. Marilynn and Michael Moch are the children of Bobby Moch. Judy Willman, daughter of Joe Rantz, suggested that her neighbor Daniel James Brown meet her father as he had interesting stories to tell; their subsequent meeting was the genesis for Brown’s The Boys in the Boat.